The village of Dubh Linn (in Old Irish) can be dated to the pre-Roman Prehistoric era in Ireland. A monastic centre also developed nearby, and in 840-841 the entire area was invaded by Norsemen from Scandinavia. They established the fledgling settlement of Dyflin or Dyflyn, somewhere near the confluence of the rivers Poddle and Liffey and it is this that became the heart of the Viking settlement, and the later capital of Ireland. The area formed a dark pool or Dubh Linn which provided a safe harbour for Viking longships. The Viking or Norse kingdom of Dublin was repeatedly attacked by the Irish kings, and it was even expelled between 902-917, but the fight to destroy the power of the Vikings in Ireland would be a long and hard one, perhaps made more so by the fact that the Viking rulers often shared the 'throne', ensuring there was always a leader on hand in case of difficulty. Many kings of the tenth century also held power in the Scandinavian kingdom of York. 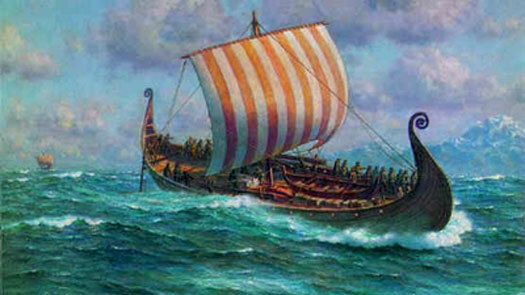 The Vikings set up their settlement as a longphort or ship camp of extremely large proportions. Their early history is sparsely recorded, and largely a case of mounting raids and hoping not to be caught by the Irish kings. They are heavily defeated at Mag Itha in 845 by High King Niall Caille mac Aedo Oirdnide. Later in the same year as the Viking defeat at Mag Itha, the death of Thorgest is recorded in the Annals of Ulster. He is captured by Máel Sechnaill mac Máele Ruanaid, king of Mide, and soon-to-be high king of Ireland and is drowned in Lough Owel. The Viking settlement at Dubh Linn may be abandoned until 853, or perhaps used as a seasonal base. King of the Northmen of all Ireland & Britain. Arrived with Ivarr the Boneless. m Aud dau of Ketill Bjornsson. Viking raids into Wales are dealt a major blow when Rhodri, king of Gwynedd, defeats a major raid by Orme. The Viking leader is killed, and the Dublin Vikings are kept out of northern Wales. Ivarr the Boneless and his brothers are the founders of the Uí Ímair in Ireland - the clan or descendants of Ivarr. They are the sons of Ragnarr Lothbrok of Denmark, and they lead the first Viking army to invade mainland Britain in search of conquest rather than pillage. Landing in East Anglia, they ravage the kingdom for a year before heading into Northumbria in 866. That kingdom falls in 867 and a puppet king is installed. The Great Army moves south, campaigning during the spring and summer. East Anglia falls in 869, and the capital of Alt Clut is sacked in 870, with Olaf's help. Ynys Manau also falls to them around 870, and between 870-871, Ivarr's brother, Bagsecg, is involved in the attacks, leading the Great Summer Army into England and adding his forces to those of Ivarr and Halfdan. 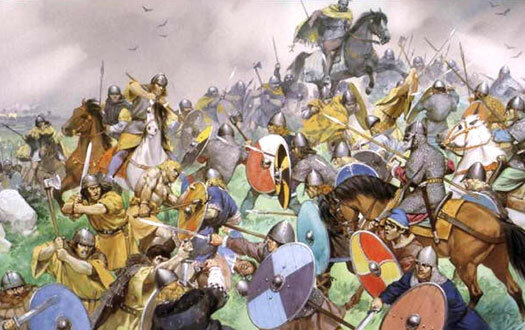 Bagsecg is killed at the Battle of Ashdown in Wessex in 871, after which Olaf returns to Norway, and the following year the Great Army is back in Northumbria. It winters in late 872 and early 873 at Torksey on the River Trent in Lindsey, before moving west into Mercia, which is defeated in 874 and a vassal king is installed on its throne. Later that year the army divides, with one half going to Cambridge and the rest heading towards the Tyne and eventually settling in York. Brother of Ivarr the Boneless. King in York (878-883). Co-ruler while Halfdan was campaigning in Mercia. Halfdan continues his family's conquering ways by seizing the kingdom of Mercia, although much of it submits to the protection of Wessex. In 877 Halfdan is expelled from the Scandinavian kingdom of York, where he had been its first Viking king. However, Halfdan may remain the acknowledged ruler of York until his death, as no one else claims the title. Co-ruler while Halfdan was in York or campaigning. Co-ruler while Halfdan was campaigning. Áed mac Conchobair, king of Connacht, has already met his death fighting the Vikings in support of High King Flann Sionna mac Máele Sechnaill O'Néill of Ireland. The annals now record that the men of North Connacht - specifically the Uí Amalgada, a branch of the Uí Fiachrach - defeat Norse forces and slay their leader. That leader seems not to be one of the more senior of their number, however. The Vikings control Ynys Manau, but they lose the island to York in the same year in which the combined forces of Laigin and Brega expel them from Ireland. The Vikings are left searching for a new base of operations, which they find in 907 when Æthelred and Æthelflaed of Mercia re-found the city of Chester and settle a Viking army on the Wirral to guard the approach. More Vikings arrive along the Mersey, setting up further colonies and creating the origins of Liverpool (see feature link, right). Sihtric and Ragnald, both descendants of Ivarr the Boneless, are active in the Irish Sea from 914. 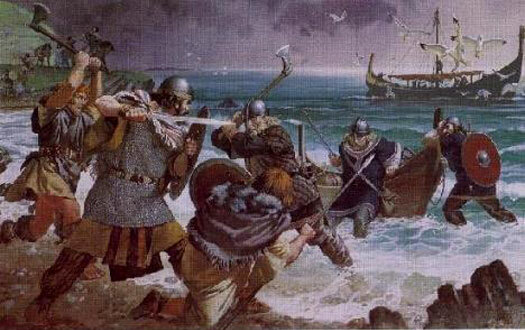 Ragnald defeats Barid son of Ottar off the coast of Ynys Manau in that year. In 917 they lead separate fleets in an attack on Ireland and while Ragnald is initially defeated by High King Niall Glúndubh of Ireland, Sihtric turns the tables and defeats the High King's army. The Vikings resettle Dublin and re-found their kingdom. Grandson of Ivarr. King in York (921-927). Grandson of Ivarr. Also king in York (919-921). Ragnald seizes control of York, destroying the slow Anglo-Saxon recovery of the region. He is succeeded there by Sihtric Caoch in 921. Sihtric goes on to marry, Edith, the sister of Æthelstan of Wessex and accept baptism. Brother. King in York (927). Upon the death of Sihtric Caoch in York, Æthelstan of Wessex invades Northumbria and secures control of it with the support of the high reeves of Bamburgh, expelling the hopeful claimant, Olaf son of Guthfrith. The West Saxon king rules York as part of a united England until his death on 27 October 939. Son of Guthfrith. Claimant and then king in York (927 & 940-942). Brother and regent while Olaf was in York. The grand alliance including the Scots, Northumbrian Danes at York, Dublin Danes, and the Welsh of Gwynedd and Cumbria, mass their forces north of the Humber in a bold attempt to destroy Æthelstan of Wessex. The plan fails, however, when the West Saxons and Mercians of the south destroy the alliance at the Battle of Brunanburh in 937. The Vikings control Ynys Manau, but by this time the once-powerful kingdom of Dublin has been reduced to a minor player in Irish politics. Dublin is sacked by High King Congalach Cnogba, adding to the weakened kingdom's woes. Olaf drives out Blácaire and takes sole control, perhaps aided by his alliance with Congalach. Son of Sihtric. King in York three times (between 942-952). Claimant for the throne at York. Briefly recognised. Restored. Defeated by the Irish at the Battle of Tara. Ireland's High King Máel Sechnaill conquers Dublin following a great victory at the Battle of Tara and a three day siege of Dublin itself, the first time the Irish kings manage to achieve such a conquest. Olaf's heir, Reginald, had also been killed at Tara, leaving the settlement without a recognised leader. As a result of the imposition of Irish overlordship, some Irish date the founding of Dublin to this year (or 988), despite its ancient heritage. Olaf abdicates and retires to Iona where he probably becomes a monk. Máel appoints his half-brother, Glúniairn, to rule the Viking kingdom. Son. Half-brother to High King Máel Sechnaill by his mother. Glúniairn is killed, apparently by his own slave when he is drunk, although the death is more likely to be the result of factional in-fighting in Dublin. High King Máel Sechnaill descends on the kingdom and installs Sitric Silkbeard, another son of Olaf, as king. In a bloodless coup, High King Máel Sechnaill is dethroned by Brian Bóruma (more popularly known as Brian Boru). It results from the failure of the Northern Uí Neill, nominally Máel's kin, to support him against the military aspirations of this king of the Dál gCais of Thomond and also of Munster, who has effectively ruled the southern half of Ireland since an agreement of 997. As a result of the sudden shift in power, Viking Dublin, never entirely conquered, fights back against Irish dominance. High King Brian Boru defeats the Dublin Norse at the Battle of Clontarf, but dies in the process. A great many other Irish nobles also die in the battle, destroying decades of hard-won Irish unity. The Uí Dúnlainge of Laigin are amongst those defeated at Clontarf, and with their usual supporters already declining - the Clann Cholmáin of Mide - their rivals in Laigin, the Uí Cheinnselaig, are able to return from relative obscurity and contest the throne there. More broadly, Máel Sechnaill is able to regain the titular high kingship with the support of his kinsman, Flaithbertach ua Néill, king of Ailech, but Ireland remains fragmented. The kings of Dublin also control Ynys Manau. Later King Margad MacRagnald of Ynys Manau (1052-1061). Restored. Ally of High King Donnchad mac Brian. High King Donnchad mac Brian's main rivals are Diarmait mac Maíl na mBó, king of Laigin and his ally, Niall mac Eochada, king of Ulaid, plus Áed in Gaí Bernaig, king of Connacht. Diarmait now installs his son Murchad as king of Dublin, expelling Donnchad's brother-in-law and ally, Echmarcach mac Ragnaill. The opposition to Donnchad grows so that he is deposed in 1063 and goes on pilgrimage to Rome where he dies the following year. Also King Murchaid MacDairmit of Ynys Manau (1061-1070). High King (1064-1072), and king of Leinster & Dublin. Son of Murchad and co-ruler. High King (1072-1086), and king of Munster. Upon the death of High King Diarmait mac Máil na mBó in battle, his close ally Toirdelbach O'Brien succeeds him. His first act is to ravage Osraige and Laigin, during which he burns Uí Cheinnselaig and takes a good deal of booty and cows, along with hostages. The Vikings of Dublin, generally known in the annals as 'the foreigners', give him the kingship of their settlement. In the following year, Conchobar Ua Máel Shechnaill, king of Mide, is murdered and Toirdelbach ravages the now-unprotected midlands. This is followed by a visit to Connacht from which he extracts more hostages, both from the Uí Conchobair and the Uí Ruairc. Laigin is divided between rivals, ending its short-term threat to his power, and Gofraid mac Amlaíb meic Ragnaill is installed in Dublin as his sub-king (or reinstalled - the dates for Gofraid seem to be confused). Son of Toirdelbach Ua Briain. High King, and king of Munster. Co-ruler. King of Laigin. Killed. The Annals of Ulster record that the grandsons of Ragnall, the kings of Dublin, are killed on an expedition to attack Ynys Manau. The ruler of Manau, Godred Crovan, in turn invades Dublin and takes the kingship until he too is kicked out. Viking problems don't end there. As high king, Muirchertach stamps his authority over Ireland by engaging in forays into Mide and Laigin in 1089. He seizes the kingship of Laigin and attacks the Vikings of Dublin. In 1093, he accepts the submission of Domnall mac Flainn Ua Maíl Shechnaill, king of Mide, while Godred Crovan of Dublin is banished. Also King Godred IV of Ynys Manau (1079-1095). Banished. Of the Uí Briain of Munster. King of Norway, and Ynys Manau (1095-1102). Of the Uí Briain of Munster. Restored. Donnchad mac Murchada, king of Laigin, and Conchobar mac Congalaig (also referred to as Conchobar Ua Conchobair Failge), king of the Uí Failghe and joint king of Laigin, see an opportunity to make the most of the faltering power of Munster - under the power of the Uí Briain. The pair launch an attack on Dublin, whose defending forces are led by Domnall mac Muirchertaig ua Briain (Domnall Gerrlámhach) of the Uí Briain (dies 1135). The attempted invasion is defeated and both kings are killed, but Donnchad's successor is soon able to seize Dublin for Laigin. Joint king of Laigin. Briefly a claimant for Dublin's throne. King of Laigin. Died in Dublin. King of Laigin. Expelled by Domnall Gerrlámhach. With the death of Diarmait mac Énna meic Murchada in Dublin, his successor and kinsman, Enna, is expelled by Domnall mac Muirchertaig ua Briain (Domnall Gerrlámhach). The Uí Briain of Munster now control the stronghold once again. Of the Uí Briain of Munster. Restored for a second time. A Norman invasion from England forces Thorkell to flee Dublin and Ireland altogether for the safety of the Scottish Highlands. However, there seems to be limited information available about this period, so the circumstances surrounding the invasion and its presumed failure are unclear. Son of Thorkell and co-ruler. Brother. Killed by Normans when he re-invaded Dublin in 1171. The Normans of England invade Ireland, and Viking Dublin and Waterford are conquered, never to regain independence. The city is used as the main base for the expansion of the English conquest, becoming the capital of the entire country, and remaining so even after southern and central Ireland achieve independence.